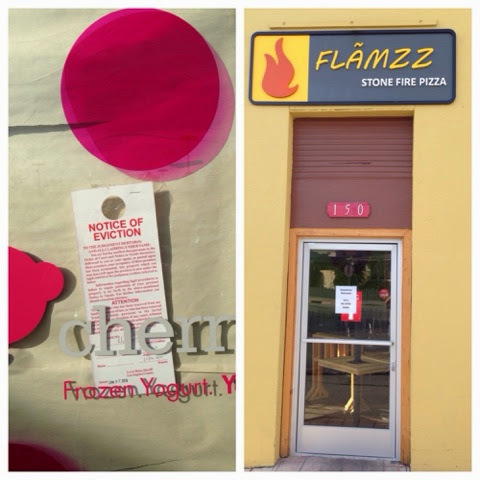 Cherry on Top, the yogurt place in the Pavilions shopping center, has a notice on the door saying it has been evicted. Too bad, I liked that place. Also, Flamzz Pizza, at the corner of Colorado and Ivy, is closed for remodeling. Thanks to Doran for the tip. I thought something was funny about the place last night, the shades were down and a table was left out. I think yogurtland was to much for them. My family tried to go to Cherry on top and found them moving out--according to a woman (owner, manager?) they were leaving because the rent kept being raised (I think she said it was up to $6000/month) and they couldn't afford to stay. Flamzz location has probably had five different names/themes in the last 5 years. Enriques Tamales, Enriques Mexican, Loteria etc etc. I hope they aren't changing again because their pizza is actually much better than the one up at Pavilions. According to their facebook page they are introducing some new menu items (could be at the Pasadena location) including french fries... That suggests to me that they may be struggling to generate business which I attribute (as far a the Monrovia location goes) to being off Myrtle and being in a very competitive market (Pizza is everywhere and Blaze is better known). I agree with the fact that Flamzz has good pizza and I also prefer it to Blaze but the location relatively boring interior design (including the bare bones tables) may cause people to go elsewhere. Does anyone know when Flamzz will re-open? I think the sign on the door said January 24th....but I could be wrong. I agree Flamzz is much better than Blazze by Pavillions. Im glad they re remodeling, it was pretty bare-bones in there.